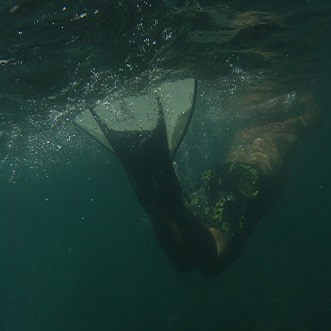 Courses range from beginners to advanced Funboard. 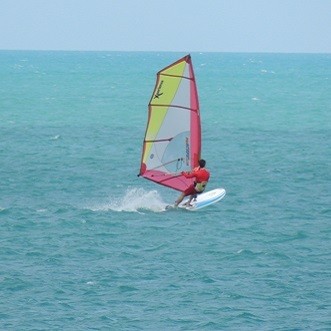 (Learning waterstart, jibe and other figures)..
Getting a good start in windsurfing is essential to your success. We only sail when the weather conditions are suitable. In the lesson we give you specialized beginner's boards that are strong and stable. 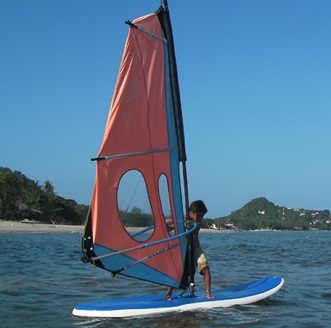 Our instructors then select a sail for each individual student. The size of the sail should be matched to each individual based on their height, weight and strength. This is a very important step to ensure your maximum enjoyment. Once you have your equipment, we show you how to put it together. This comes in handy if you want to rent equipment at a later time or you are buying your own. The rigging process is an important part of windsurfing and its easy when we show you how., next we start on the sand for a short theory lesson, we explain where to sail, how the wind works and what to look out for. We show you how to align your board to the wind, how to pull up the sail without straining your back, turning techniques and sailing and steering techniques. Then we take you onto the water. Using a correct launching technique and our instructors get into the water with you to help you apply the techniques you have learned. We don't go too far from shore, and we concentrate on giving you a reliable technique that will give you confidence in the water. Our instructors start by holding your boards in the shallow water as you get going, giving you constant feedback and encouragement, then as you progress a little further from shore, our Instructors show you more advanced skills. Wind-basics, balance-basics, self-launching, rope-start, rope-turns, mast-turns, tacking, fast-tack, basic jibe, beach starts, upwind sailing. After this course you should be confident enough to rent beginners equipment and practice on your own. 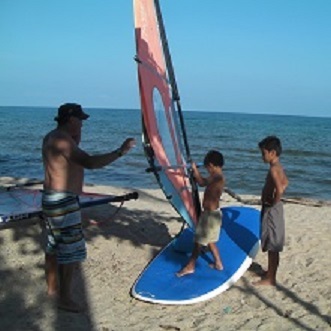 The "Funboard Basics" windsurf class includes two hours of instruction on floaty transition boards, or shorter bump & jump type gear. 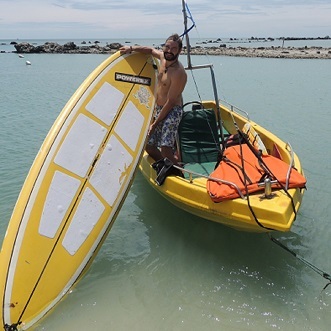 This course is great for people with longboard experience who want to get into sailing stronger winds on smaller gear. Allow yourself a few extra days to accommodate variable weather conditions. 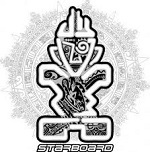 In this class we cover; Short-board Basics, Board trim, beach-starts, waterstart tips, how to use the harness, getting into the footstraps, and how to do some basic short-board turns and maybe some basic intro to some jibing. This course can also be a great refresher class for people just getting back into the sport after an extended absence.